Yah it’s Friday!! I am so happy for the weekend to be here. No immediate plans, just happy I can sleep in a bit! 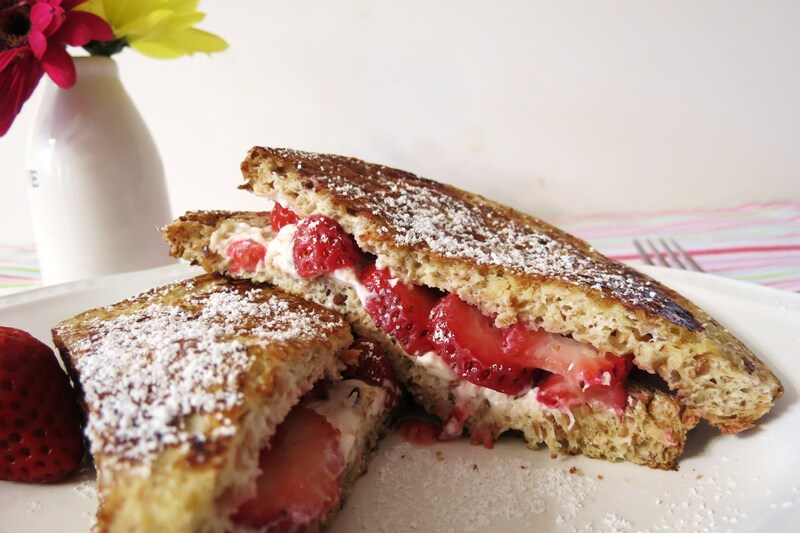 For your weekend breakfast I have a wonderful stuffed strawberry french toast recipe just for you! I got this idea from Food Networks Dinners, Drive In’s and Dives a few months ago and it was sitting in the back of my mind forever! I am glad I finally made it!! This was quick, simple and the flavors are amazing! I love the combination of cream cheese and strawberries together. Mmmmm, creamy, cheesy, sweet, yum, yums! They key to keeping the calorie count low on french toast is the bread. I used Alvarado Street Bakery Bread that I picked up from Trader Joe’s. It’s wheat bread with flax seed and only comes in at 50 calories a slice. So if you use a different bread just be sure to knock off a 100 calories of my bread and add yours in. I really like the bread because it’s soft in the middle and the crust is kind of crunchy. 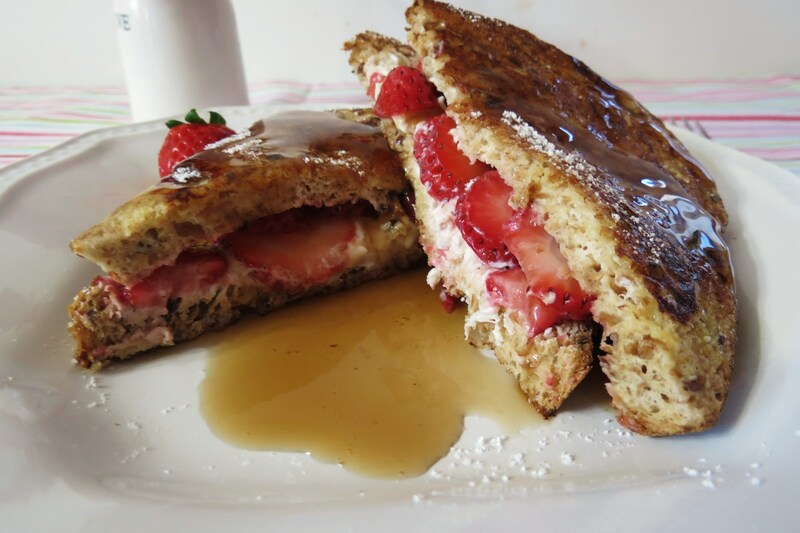 I figured having french toast would be a different change-up from my usual pancakes. I’m so glad I made it! You could also use other fruit you like such as thin sliced apples and pears or other berries. Me, I have a love for strawberries. Like a mentioned last week, you’re going to see a lot of strawberry type recipes. Why I haven’t gotten sick of strawberries, I’ll never know? In a shallow bowl, add egg white, milk and vanilla extract and mix until combined. Set a side. 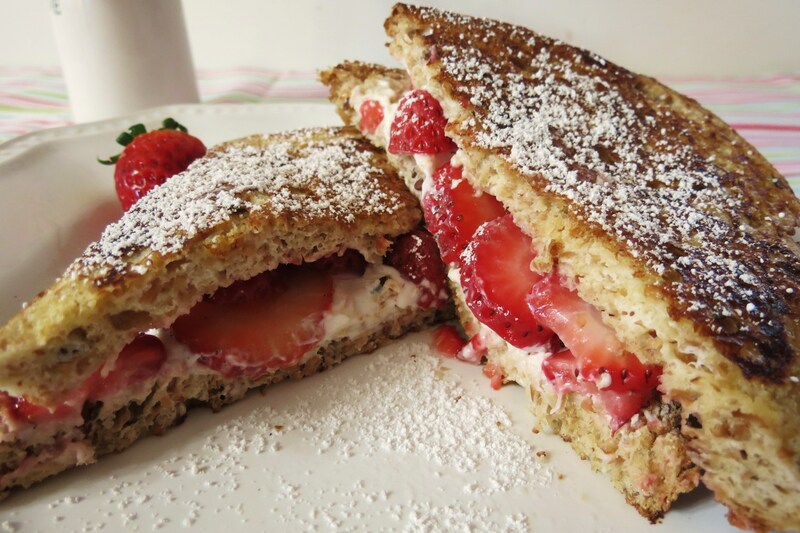 On one slice of bread add your cream cheese and top with strawberries. Add other slice of bread to the top. Carefully dip your sandwich into the egg white mixture, than carefully turn the sandwich over to cover the other side with the egg white mixture. Place sandwich in a skillet and cook until bottom is lightly brown, than carefully flip the sandwich and cook until bottom is lightly brown. Cut in a diagonal, top with powdered sugar and maple syrup. Eat and Enjoy! See you tomorrow and I’ll be back with a completely new to me recipe, that I made just for the Holiday Recipe Club! 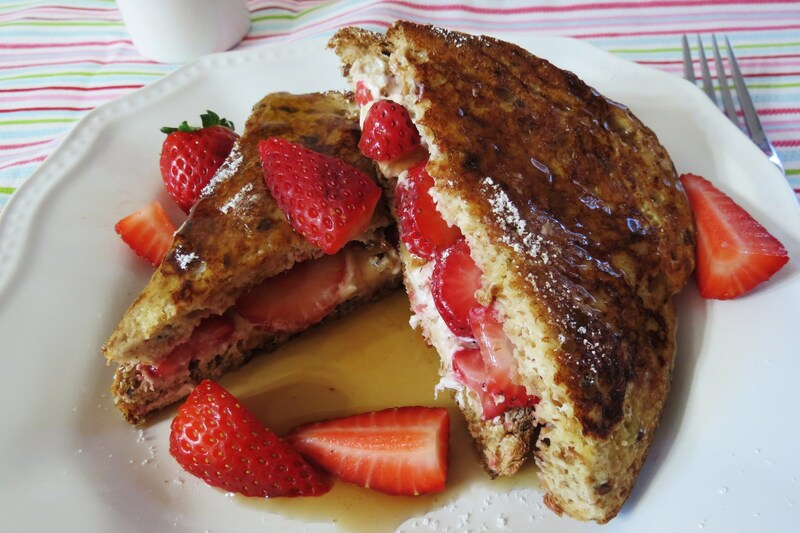 Stuffed french toast trumps pancakes any day:-) The cream cheese and strawberry sounds great!!! This look absolutely SINFUL. Since it’s healthy, I can eat a bit more, right? Oh my gosh, this looks absolutely amazing! Yum, I would’ve loved to have these this morning. This is definitely kid friendly! The kid in me loved it!! Oh wow, this looks absolutely amazing! I am definitely trying this next time I have a leisurely morning. Your pictures are making my mouth water! Ahhh, thanks Anna! Have a wonderful weekend! 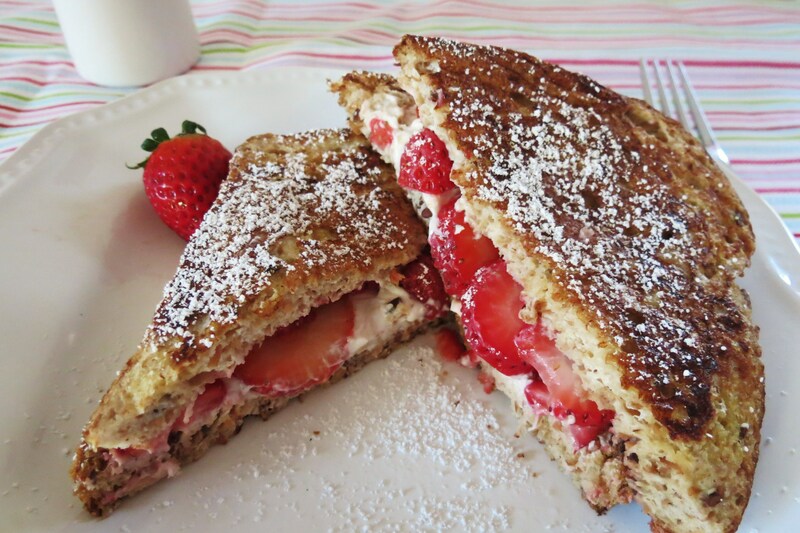 Mmmm, I love stuffed French toast. Such a treat! I was surprised how easy and tasty it is!! This is topping one of my favorite breakfasts!! So this is bookmarked and will definately be made in the near future! Looks like a great recipe for Mother’s Day next weekend! Just need my husband to learn to cook in the next week, haha! Thanks for the invite! I linked up! I just love breakfast and i love that you have Breakfast Mondays! These look delicious! Great photos! Thanks Danielle! Have a great night! French Toast makes me happy. This would be so good for desert. I bookmarked it for later. Thanks for sharing with us. This is delicious! I just made it for breakfast and it was such a great meal! I also feel soooo much better than if I went to IHOP and got their stuffed french toast. I added some cinnamon to the egg mixture and it was great! I’m so glad you like it!! I feel so much better have these kind of goodies at home. I don’t know what restaurants put in there cooking to make things so unhealthy!! 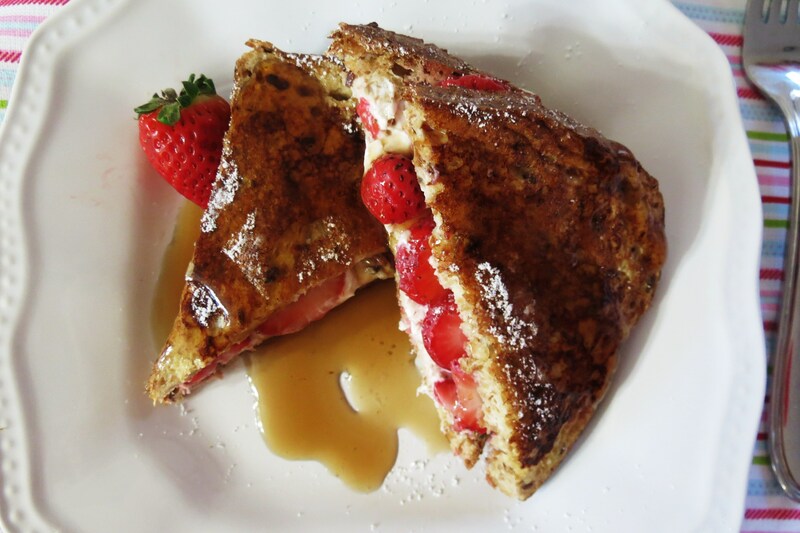 Love french toast on sunday morning. Looks delicious with the cream cheese.Thanks. It looks amazing. I wrote the recipe down and i’ll try it!